I'm playing at the Sunday Stash party with the fantastic and fanciful Molli Sparkles for a second week in a row! 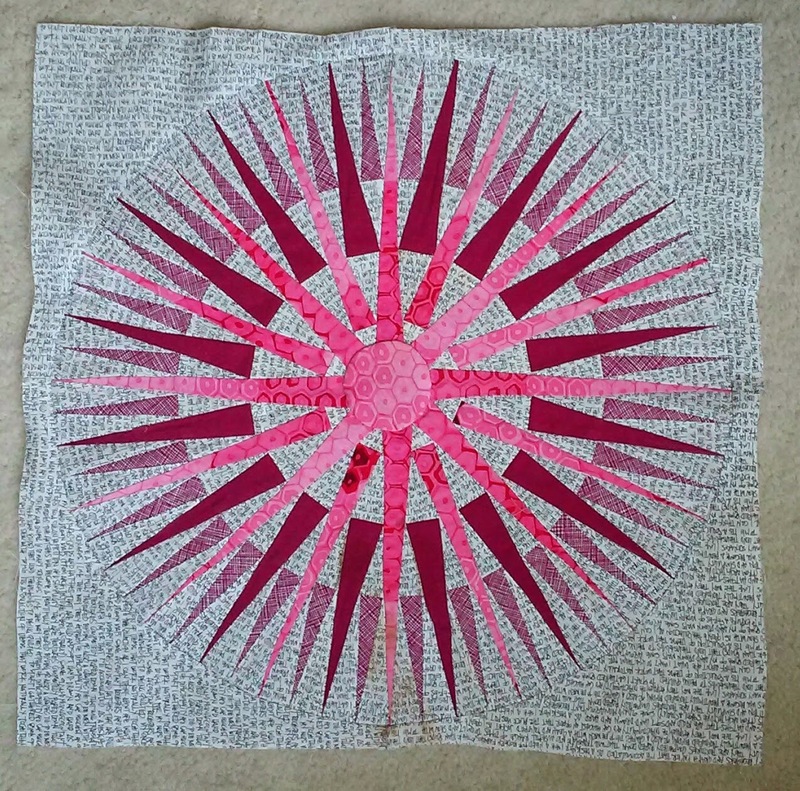 When I started writing about my quilting adventures I didn't have a stash to speak of. I cringed at the sound of the word. 'Stash' gave me chills. When I heard someone say it, I couldn't help but think that if I did have a 'stash' then I would have to admit to my hidden, crafty, quilt-making obsession. I would have to 'come-out' of the quilting closet! I have accepted myself as a quilter. I find that I am drawn to places that other quilters frequent, like fabric shoppes and sewing expos. I now know where like-minded people hang out on the internet and learn from those who have accepted and embraced their quilty habits. I look up to those who generously share their insight and impeccable work. I choose to be an out and proud quilter! There I said it. One might think that as a proud young quilter I would become accustom to my growing collection of quilting fabric, but honestly, I still have reservations about my stash. First let me show you the good stuff, then if you would like to stick around, I'll tell you about the skepticism surrounding the stash. What is that paper all about? The selection above is what I've chosen for a fun Mystery Quilt hosted by Cheryl over at Meadow Mist Designs. The fun is just about to begin, so you should check it out if you want to play along. 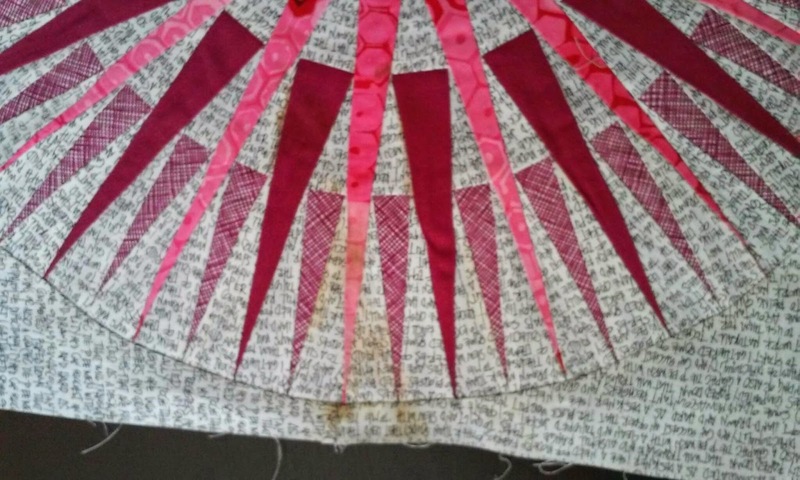 All I know so far is that we need three groups of fabric: A, B, and C, and the suggested amounts for each which are detailed at her blog. Carolyn Friedlander Architextures crosshatch in ??? Nellie's Garden 415C also a magenta with hints of orange. Phillip Jacobs for Rowan. Westminster. Group B is the background fabric. I am choosing to use only one fabric for the background. It is this fantastic feeling grey cotton. 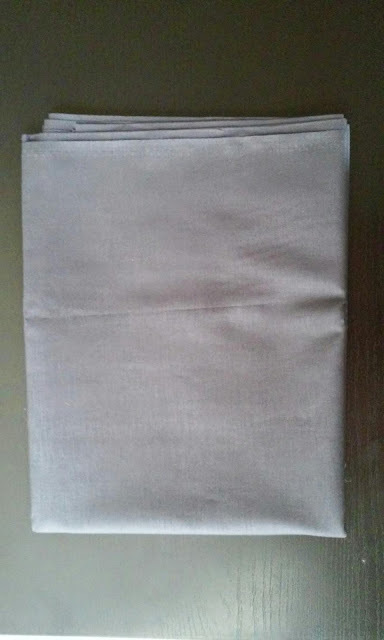 I cannot remember who makes it, or what the exact color is, but I do remember that the kind person at the fabric shop saying that this brand has quickly become the staff favorite because of it's soft feel and slight sheen. It's actually a bit darker, but there is some reflective light bouncing back from it. Well you're here at the bottom of the page with me, so now the "SKEPTICISM SURROUNDING STASHES"
1. The perfect stash is an unobtainable goal. I sometimes feel that an underlying message in online media is to buy, buy, buy (And I don't mean the 'N Sync version). 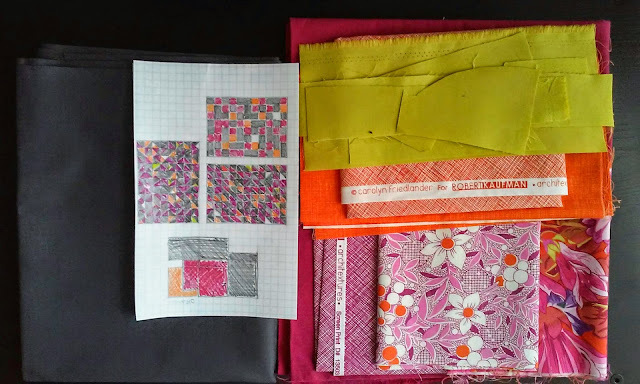 I see images of beautiful work rooms with shelves of lovely fabrics and well organized notions. I know that these images represent only a handful of quilters, but equate them to unrealistic images of models in magazines. That image takes, hard work, sacrifice, time and money. 2.Too much fabric may stifle creativity. 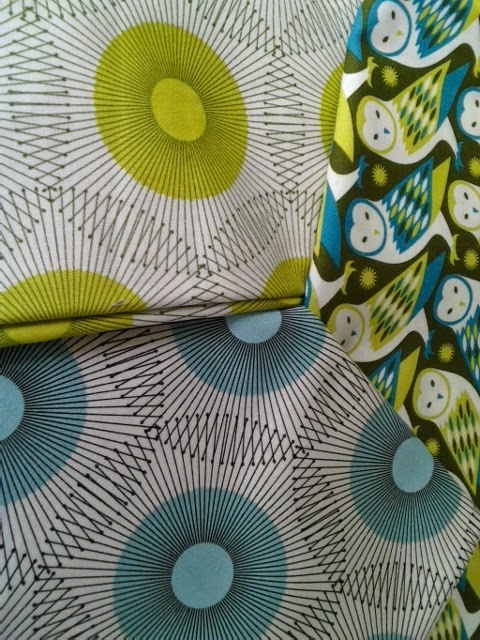 I have been known to buy fabric because it's gorgeous and I just want it. Then comes along a brilliant pattern that the gorgeous fabric would work perfectly for, but I have in my mind decided that the fabric is too dear to me to use. What if it doesn't look right? What if there is something better for this fabric to come along? 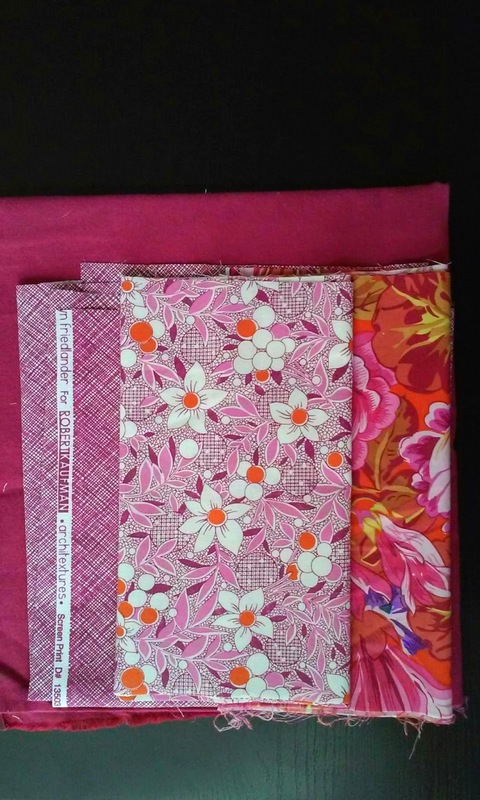 I have a couple of fabrics that I'm going to bite the bullet and make use of here, so that they are not just a part of the stash. 3.. 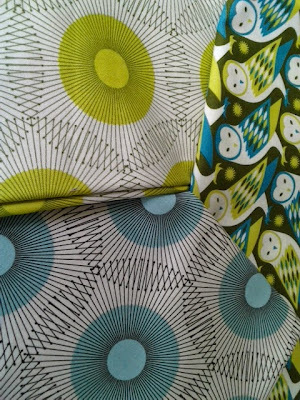 Finally and most importantly, I feel that having a stash of fabric goes against the traditional nature of patchwork. 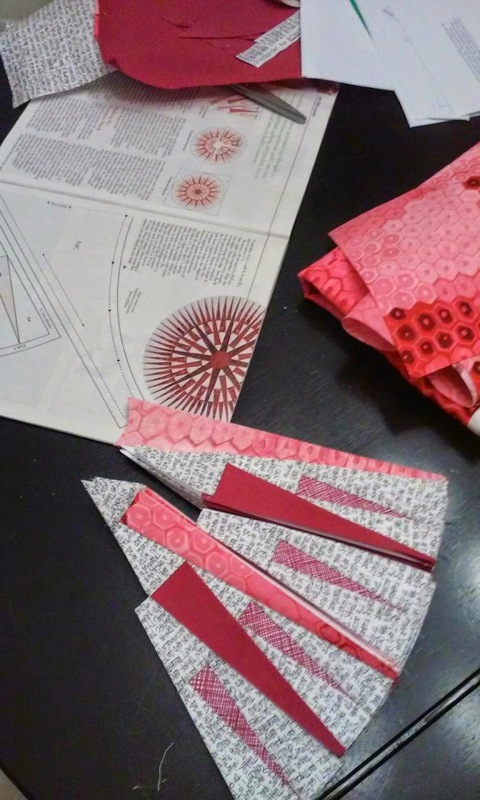 A hobby, craft, and art that appears founded in frugality has taken on a lavish tone. I think it is important to 'start where you're at and use what you have.' I'm fortunate to have the ability to supplement my projects with new fabrics, but would like to ensure that none of my purchases go on wasted. Now don't get me wrong, I love fabric. I love the colors, the patterns, the textures and even the smell. I probably would have a fantastically plentiful stash, but then I would wonder how I would find the time to use it all up. Do you have trepidation about a stash? Are you stash busting or stash growing? I would love to know your point of view on the topic! Before I could take a picture though, I wanted to give the block one last press to see if it could be just a little more flat. That's when my iron decided to leak some ghastly brownish orange liquid on my quilt block! What do you do when your iron pees on your fabric!? What is wrong with my iron?! I decided to take a picture to show the damage. The lighting last night did not show the extent of the damage, so I knew I would take additional photos in the daylight before I could finish up my post. Here is a close up of the damaged area. I'm not sure if you can see it, a slight rust stain around those precious points. Now the purpose of the post is a plea for help! Google Goggles is an app that I had heard about and downloaded a couple of days ago to play with. My understanding is that you could use it to take pictures of QR codes, UPC symbols and major logos and then search the internet based on the image. This is probably no big deal to the 'tech-ier' people of the world, but advances in technology are always surprising to me. 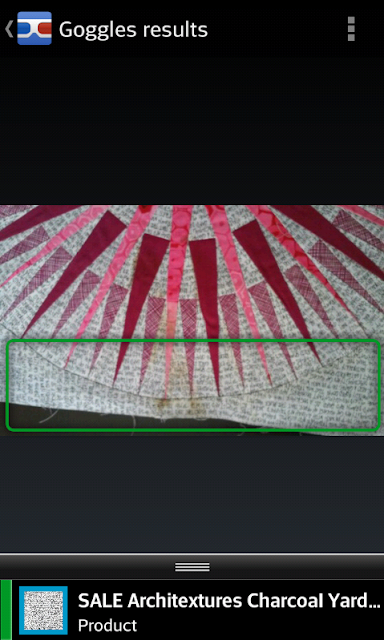 Google Goggles scanned the image and was able to decipher what the main fabric was and then located it on sale on the internet! I should clarify, that while I did not intentionally use the app to search for the fabric, the app was running in the background of my phone from playing with it a couple of days ago. Now this post has more of a "I need to share about this 'What?!' strange/intriguing thing that just happened and ask if anyone else has been using the app?" kind of tone. Have you ever had a blog post go in a completely different direction than what you intended? Do you use Google Goggles? 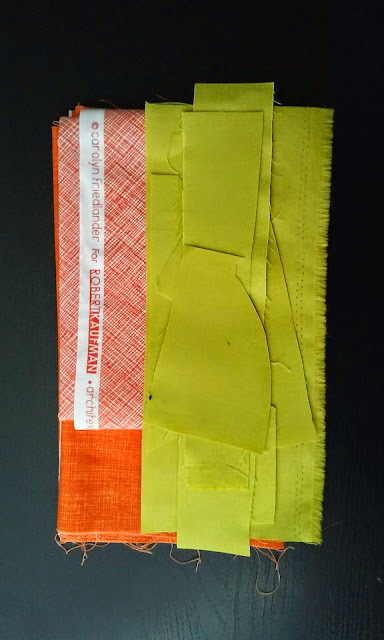 What other apps do you use in your quilt making? I'm linking up with Diana at Red Delicious Life, who is guest hosting Anything Goes Monday! 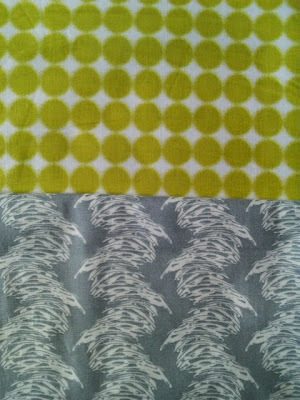 I often feel guilty when I shop for fabric, especially when I make a purchase without a plan for what it is to become. Yesterday, however, Shark suggested that the fabric store be a part of our Saturday adventure. While I was hesitant about going into the store because I knew how dangerous it could be, he was encouraging.. 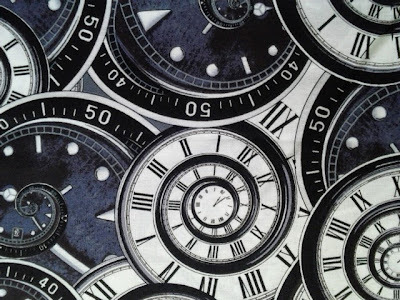 He picked out this clock fabric, it was in the 50% off bin. 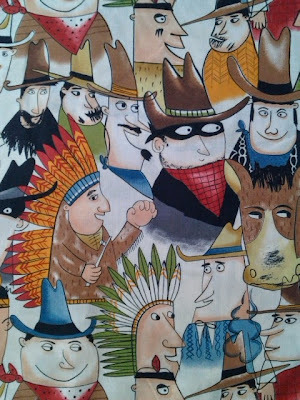 Also in the 50% off bin was this fantastic illustrative fabric from Alexander Henry. I was eyeing this fabric the last time we were in the store, but didn't get any. This time, at half off, I bought the end of the bolt. 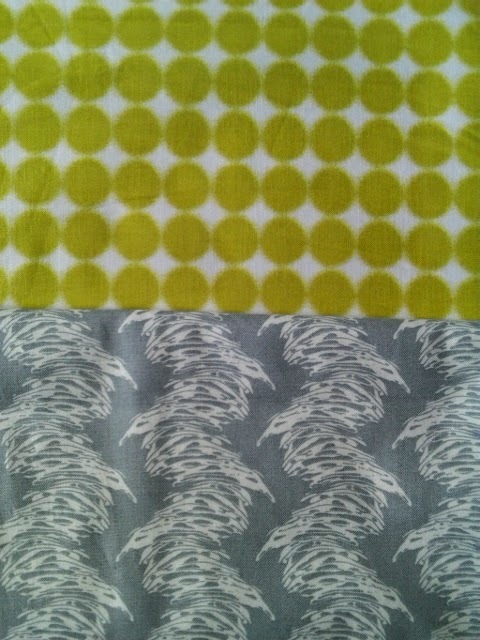 The chartreuse and grey caught my eye.The dotted chartreuse pattern is a Ty Pennington design. The grey is from Andover. Shark also found this great line. While not in the half off bin, I had a hard time passing up on the colors and kitsch. Finally, there was this batik. 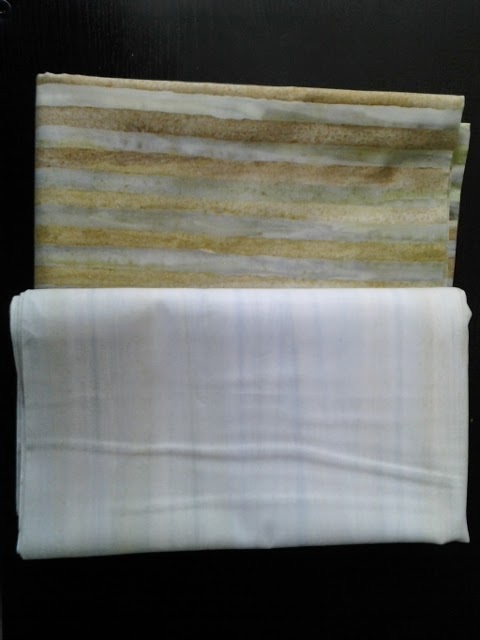 The lighter batik (below), from Robert Kaufman seemed like the perfect match for the mossy striped batik (also from Robert Kaufman) I purchased last weekend on my second trip to Heartfelt Quilting and Sewing of the week! Herein lies my initial hesitation to going to a fabric store. . .I had already purchased 2 other times less than a week ago! If you don't know me, I have a thing for striped fabrics and have been working on a couple of projects involving stripes, you can see more about those, here (also a rather compulsive stripey purchase!) and here. Alas, I'm not sure I like how the light fabric plays with the stripes. I think it makes mossy colors look too heavy. I may compliment them with a medium grey to lighten and brighten the colors. I am linking up with Molli Sparkles for Sunday Stash. I would say that he has served as a catalyst for me write about my quilting adventures, and to pursue quilting more heavily. Thanks Molli!